Warm and sheltered from the rainy British weather in a beautiful Malaysian restaurant, we joined our Bengali friend and her mates for a big 3-0 birthday dinner last night. I hastily turned down the strange request only to realise he was refering to the option of a mini nibble between the starter and main course. As I tucked into my spicy marinated quail and coconut rice, I thought fondly about the sunny weekend in Cambridge and the other Indian BBQ dish I made. It was a tandoori paneer shashlik – chunks of Indian cheese marinated in a tandoori masala and threaded onto skewers with peppers and onions. Paneer can at best be described as solid buffalo mozzarella when hot and polystyrene when cold (Not that I eat polystyrene regularly or anything). It is widely available from Indian shops and I have even bought it at the local supermarket recently. The paneer gets marinated here in tandoori masala. This is just about the only pre-mixed spice powder I use, because a) it’s a drag to make it from scratch and b) it won’t stink your house up because you tend to cook it outside. A popular vegetarian tandoori dish at home, this was real hit with the British and Peruvian members of our family. Try this dish with some naan for a really lovely summer lunch. Chop the paneer into bite-sized cubes, about one square inch each and puree the ginger and garlic. In a medium-sized bowl, mix the cubes of paneer with the yogurt, tandoori masala, ginger, garlic, lemon juice and some salt. You want a bright red, strong marinade. Now chop the peppers and onions into large, even chunks – halve and then quarter. In another bowl, mix them with the oil and some salt. Finally thread the ingredients into bamboo skewers – pepper, onion, tandoori paneer, pepper, onion and another cube of paneer. Repeat this with 10 skewers. 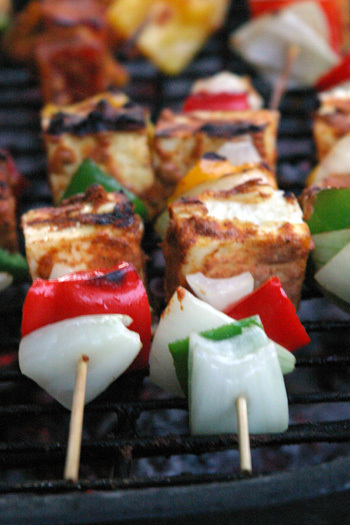 When the BBQ is ready, cook the skewers until the peppers and onions get charred on the outside and the paneer softens to a mozzarella -like texture. 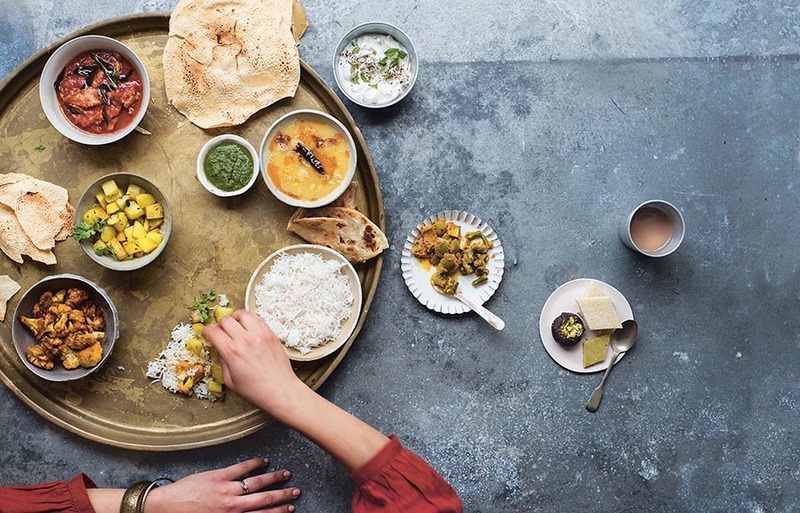 Eat it straightaway before the paneer goes cold. Happy I day to you. Shashliks look great. Enjoy. That was interesting. A good recipe. Lovely colors.. Is their an inter-course b/w starters and main course? When this gonna stop, God knows! so what would’ve happened if you said ‘yes’ to the inter-course? curious mind wants to know. That was priceless! English is so marvellously (?) adapted, isn’t it? Funny story! This looks really yummy! Hi Mallika, LOL! the picture is making me J! hahahaha…… I am trying to imagine the expressions on all your faces!! LOL!! Errrr so what did you have … 🙂 ? That burst of colour is an utter show stopper!!! And that was FUNNY 😀 May be its their policy to make the customers laugh out loud to increase their appetite….both your tikkas look absolutely pro! haha…”inter-course”! Now that’s a course that would peek anyone’s interest! lol! Tikkas looks to-die-for! Very good pic and interesting recipe Mallika. Have to try and see if my Indian grocery store here stock the tandoori masala pwd…. Great writing thank you. I love foreign food, reading about it too! ?our site. Would you possibly be interested in swapping links with my best blog site? I am interested in great partner blogs that offers quality content.